So I used to use Google Apps Free (now not available) as it was pretty good, and better than Hotmail at the time, plus it was free, and well featured. But Google has been cutting features out of the free version, things which are essential like EAS support (there isn’t a suitable mobile optimised protocol to replace this in my opinion which I will discuss shortly). So recently the BYOD Wi-Fi at work stopped working for Windows Phone devices as its not officially supported. Since then I have noticed that the Mail applications data usage has been very high (using 250mb+ in 2/3 weeks), which has pushed me over my data limit. This confused me because it never used to do that before we could use the BYOD Wi-Fi at work (which was turned on in February). Turns out that between then and now, I have installed GDR2 which switches all Google Accounts from EAS to IMAP due to Google cutting EAS support, and IMAP is horrifically inefficient it seems. And its not just my data usage it was eating up either, it was also my battery life. Since moving back to a EAS account, my battery life has shot up. This is just another example of Google cutting useful features, or making changes to existing products to try and encourage uptake of their other failing products. So in this case it is to ensure people use their Gmail app (on supported platforms which are just Android / iOS at the moment as far as I know), which gives Google more control. And for those not on Android / iOS they either have to suffer, or switch. If they suffer it is likely they will blame Windows Phone for the high data usage, poor battery life, not Google, which also helps Google get people to switch to Android. Can Microsoft Succeed in the Mobile / Tablet markets? Firstly lets define succeed, this doesn’t mean to become the biggest market share holder, but to take a significant chunk of the market – be a major player. This isn’t like Mac vs. PC or Betamax vs. VHS where there can only be one winner, its different this time, there is room for 3, and it’s very possible for there to be three or more major players and for the consumer it is essential that there are more than two major players to keep competition alive. The big difference this time is that Microsoft cannot use its old tried and proven method of breaking in to market – sell it cheaper, let it run on anything and everything, and profit through volume. It worked for Microsoft with Windows, and IE, But Google has already taken this strategy and taken it to the extreme, Microsoft cannot undercut free. Microsoft has its back up against the wall. So they need a new strategy, one similar to what they did with the Xbox which overtime, was very successful, even though it had initial problems, tough competition, and it was in a market, where the game was considered over. A lot of people I have discussed this with, have said that its game over in these markets, and it’s too late for Microsoft to make an entrance (hopefully some of the above should distil that) but, these are new markets relatively, and the markets are far too young, and too fast changing to say that the game is over. Android is still making considerable progress against iOS in the smartphone market across the world, and the Tablet market is hardly developed and still has a lot of expansion and growth to go under. A market cannot be in a position where a winner can be declared, while there is such rapid growth and market share changes. There is all still to play for! So what is Microsoft’s Strategy? Firstly, they are going to try and match their competitors’ prices (maybe even slightly undercut it initially). This has to be done, to get consumers on-board. Secondly strike at the enterprise. This will be easy for Microsoft, integration with their existing services and manageability tools means Microsoft can win this hands down, and this will expose the devices to a large number of consumers who are likely to then buy the devices at home (comfort, familiarity, etc.). Finally and this is the key part of Microsoft’s strategy – is that Windows 8 and Windows Phone 8, offer something unique and different, to a market that is very polarised. At one end you have Apple’s completely closed ecosystem, limited or no choice in hardware, or services. At the other you have Android, where you have a multitude of devices from the very good to the absolutely terrible, where there are any number of services you can use, and a very open ecosystem. What Microsoft is going to do is to provide a middle ground. A limited number of very good quality devices, across a number of price points. Along with a restricted set of services (this is needed to solve malware issues that android suffers from) which users can trust. They are going to try and provide the best of both worlds, choice and quality. Everything so far is just Microsoft’s attempt to catch up and compete. Microsoft has also provided a number of new and innovative bits of functionality (not all of these apply to both markets). A brilliant development environment, with lots of choices. I think all of the above means that Microsoft has a good chance of becoming a major player in these markets over time, as long as they don’t allow long periods without updates (they need to move to a yearly release cycle for Windows in my opinion), it’s far too early to rule them out! Wow just wow, I was not expecting Microsoft to announce that last night, and I think (yes I know I am a bit of a fan-boy) this is the tablet which defines what a tablet should be. The iPad while good, was simply good, it was not excellent, it was not brilliant, it was not a replacement for a laptop, it wasn’t a productivity device. It was a device that was hard to justify buying, and mainly there for consumption and entertainment. Basically it was exactly what you would expect from Apple. Microsoft has given us what we expect from Microsoft. A device which is great for consumption, but also brilliant for productivity. I finally fill like I can sell my Laptop (MBP) and my iPad and just have one device. This has always been my issue with the iPad, that you cannot just have an iPad sooner or later you end up needing a laptop to do something. This has happened to me a number of times. There’s too many restrictions in the iPad, too many compromises. What MS allows, mainly due to Windows 8 is to remove as many of those compromises as possible, the biggest one remaining is Legacy Software on ARM, but this is one which is acceptable to a degree (although there might be ways around it) for security and resource management reasons, to ensure the user gets the best possible experience. But this coupled with such a lovely bit of hardware like the surface, extenuates this. You have a tablet, like the iPad, with a similar cover, but in a few seconds, it turns into a lightweight laptop, but one which is just as useful as a laptop. I don’t have to worry, about if I need a laptop, I am already carrying one. The Touch Cover is an amazing bit of engineering, and will seriously improve the typing experience. My fingers hurt after prolonged typing on the iPad, its simply not comfortable. The Touch Cover will improve typing speed, and comfort while increasing the usability of the device, without having to carry around a bit heavy keyboard. As MS mentioned in its keynote, the displays are “Retina” (using Apples definition of not begin able to distinguish pixels from a normal usage distance). They might not be as high on the ppi scale as the iPad, but using other clever technology they have achieved it, which enables lower power usage. Yes, if your a purist you might say the screens let it down, but I think we will have to wait and see to pass judgement on if ClearType is an acceptable substitute. Yes the iPad will have more apps on its App Store, but it is just a matter of time for Windows 8 to catch up, and I am sure the quality will be just as good if not better. 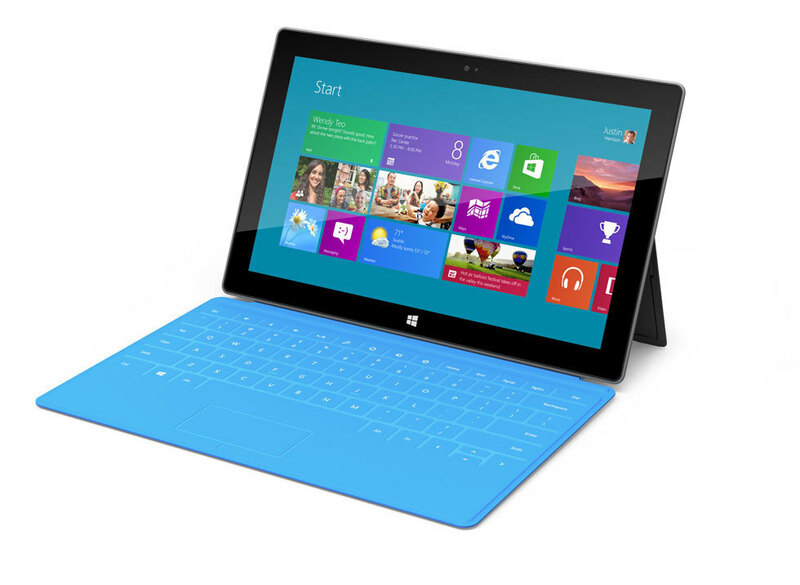 Developers should want to develop for Windows 8, because of the shear number of devices it will be on – not just tablets. The only reason I can think of, why they announced it now, is because they are about to go into mass production with the device, and this would have lead to leaks (Most of Apples recent devices have been leaked, due to manufacturing leaks, parts lists. But that does not excuse the lack of details, which must surely be set in stone by now. I do not think we will ever know why MS announced when it did. Finally why no 3G/4G support. This seems like such an obvious thing not to miss out, unless they just had not decided on it, as part of the final specification yet. So I will definitely be buying one of these, but which one. That I have not decided yet. Part of me feels I should get the ARM one, lighter, thinner, cooler, longer battery life, but there is a little bit of me, that wants the Intel one, just so I can open Visual Studio, and do a bit of development, and perhaps put some of my favourite classic games on it from GTA to SimCity, but that is at the compromise of much lower battery life, hotter, thicker and heavier. I think I will end up with the ARM one, for the reasons given above, but also because I want, hope believe, that these publishers will release metro apps which will give me, the functionality I want without needing to go to the desktop. There is no reason why there should not be Windows 8 Metro versions of GTA, or SimCity, just like there are on the iPad. I also have some plans for applications which I will hopefully release when Windows 8 is released which should hopefully give me some of my development opportunities back on Windows 8 Metro. Building its own PC Hardware is a big departure from the norm, for Microsoft, and will have a massive effect on how the OEM’s act and behave. But lets be honest here, a lot of OEM’s have failed MS and their users, and MS is simply saying to them, ‘This is the quality of the device we want you to make, no crap ware, original thinking, put the user first’. MS have set the bar and it is the OEM’s job to jump it. I feel, the device is great, almost perfect for the future of computing, and I am very excited for it. Just cannot wait to get my hands on it now!! !